Yes! Oatmeal Fufu is made from Quaker Oats. That grain you enjoy so much for breakfast. The great thing about oats is that they are healthy and great for weighloss. The way it works is that Oatmeal Fufu will make you feel full faster hence you eat less than the quantity of other fufu meals you would normally consume. In additional to that, it makes you feel full for a long time hence less food cravings between meals. It is great for those who want to lose weight or maintain a healthy weight. You can either use rolled oats or ground oats (oat flour) for making Oat Fufu. If you would be eating oat fufu on a regular basis, it is better to buy ground oats if these are available where you live. If not, buy rolled oats and blend with your dry mill (for egusi and ogbono) or coffee grinder. I usually make the Oatmeal Fufu that I can finish with one and a half cups of water. I pour this into a clean pot and set to boil. When it boils, reduce the heat to low and steadily add the oat flour into the pot of water while mixing at the same time with a spatula. Watch the video below to see this in action. 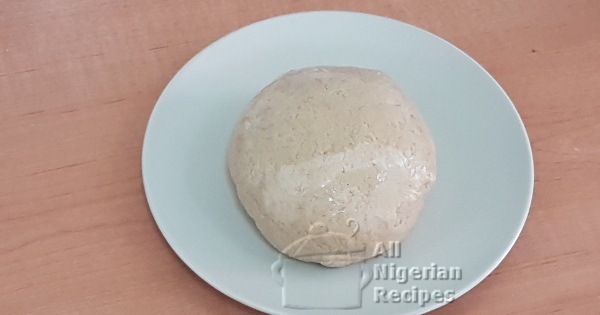 As the mix becomes thicker and you can feel it on your spatula, stop adding the oat flour but keep mixing till a smooth ball of dough is achieved. Add a few drops of water to the oat fufu, cover the pot and let it steam for about one minute. Mix again till everything is well combined. Serve Oatmeal Fufu with your favourite Nigerian Soup. Click here for all Nigerian Soups.